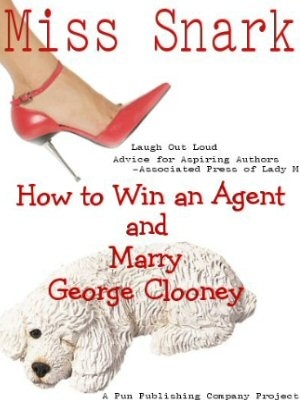 Miss Snark, the literary agent: Melanie Lynne Hauser is Right on! That says it pretty darn well. I feel famous by association! And just as an FYI, that book that Melanie wrote but didn't sell is called Humble Pie! Go Super Mom who is also Super Plotter!! I'm always disappointed when the human life cycle subtitutes for plot. Melanie and I are friended on MySpace. Sounds like Melanie was in the "On Golden Pond" group, but joined the "Jurassic Park" bunch... hmmmmm! We all know life is tough - then you die! I may have worried for nothing. Mel is one smart cookie--one of the clearest thinking writers never to get a college degree I know. She can run circles around many with graduate writing degrees. Ooh, cool. I go out for some Christmas shopping, and come back to find I'm a blog post on Miss Snark! I feel so special! Where was the Loc Ness Monster in the golden pond? Why didn't the lawyer get spanked by the T-rex? I disagree with Mel. Timeless literature is almost always character driven, but it has to be done well. Virginia Woolf, James Joyce, William Faulkner, Charles Bukowski, Alfred Chester, Vladimir Nabokov, Rilke etc., I would prefer to read Ulysses or New Yorker fiction than a series of formulaic events. It's a waste of time to know how a novel will be before I've read it (character has a want, want is stifled, in the end the character is somehow better or has an epiphany). It's very difficult to write good character driven fiction. It's quite simple to write a plot. Timeless literature is almost always character driven, but it has to be done well. It seems to me there are plenty of classic plot-driven works out there, like The Odessey, Morte D'Arthur, Brave New World, 1984... And there are many classic works that are more character-oriented (say, A Tale of Two Cities, Heart of Darkness, Lord of the Flies...). I wouldn't say that timeless literature is "almost always character-driven." It's a waste of time to know how a novel will be before I've read it (character has a want, want is stifled, in the end the character is somehow better or has an epiphany). Wait -- are you describing action here, or character growth? Because it seems to me that in a character-driven novel, the characters have to encounter some obstacles before they can actually grow, and in the end the character is "somehow better or has an epiphany." It's very difficult to write good character driven fiction. It's quite simple to write a plot. You've just dismissed all genre fiction. (Who knew that writing a thriller was so damn easy? Or mysteries? Or romantic suspense?) Play fair: Admit that it's quite simple to write poorly, and that it's very difficult to write an exciting, salable book--whether it is character-driven or action-oriented. I think that it's both elements that are needed in today's market: likable (or at least interesting) characters who grow AND an engrossing plot (read: action). Sure, there are exceptions. And not all books that succeed in today's marketplace will become timeless classics. But some will. Actually, I've read some godawful "character-driven" literature. Which didn't have a hint of plot. Like Saul Bellow's book (the title of which I have mercifully forgotten) where the character took 69 pages to cross the room at a library. Snooze. Plot happens when opposing forces (onstage and off) clash. No conflict (internal, external, paranormal, etc)=no story. If your readers don't care about the characters, they probably won't care about the plot. A coincidence might get the ball rolling, but most good books are really character-driven, whether they be genre or "literary." Anon's comment that plots are easy to write is absurd. You can write a three hundred page character sketch (or a much longer one, like Ulysses), but if the characters don't cause something significant to happen, then how many people will give a damn? Hmmmmmmm, I frequently find myself annoyed with the so-called "plots" of many novels, esp. when the plot substitutes for characterization and character growth. I’m not saying that ALL plot-driven books are like this, but, IMO, far too many are. Give me a good, character-driven novel any day! I was always taught that nobody wants to hear the story about the day nothing happened. Conflict can be internal if it's compelling enough. But you have a much larger target to aim for if you go for external. And maybe it's simple to write a plot (but maybe it's not), but it's not simple to write a compelling plot acted out by interesting, three-dimensional characters. Note I never said to forgo exquisite characterization - I even said that's how I start. You can't sacrifice one for the other, but neither can you have one without the other, and I think that's a mistake a lot of new authors make. At least, it's a mistake I made. And when you're trying to break into publishing, I do think that plot matters a bit more than characterization; it's how the publisher is going to sell the book. And it's also more important when writing the hook, the discussion of which is what started all this commotion anyway. I'm happy to see someone reaching the same sane conclusion i have. The last decade's seen a character hype resulting in good stories being replaced by introvert awfulness on the shelves -- at least in the genre I prefer to read. As a paying customer I'm not happy.